By now you may have a few databases. You might want to move those databases to another server. You might just want to back up the databases regularly in case you break them or data gets deleted. In PHPMyAdmin make sure you have a database selected (click on a database name on the left). Now click on the Export tab. Press Go and your browser should download a file (if not see below). 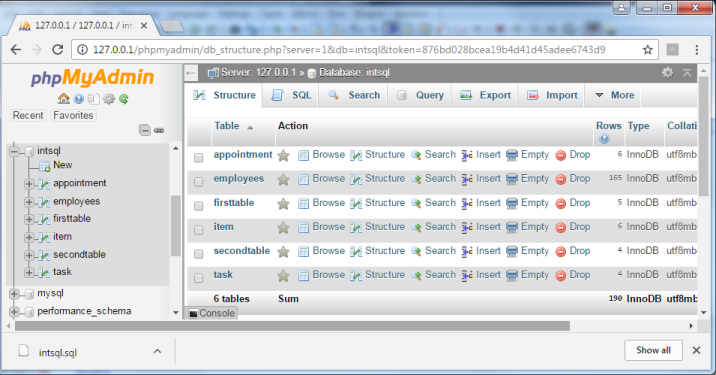 This will contain queries to re-create all of the tables and data in your database. If you have more than one database repeat the process. If you got a Web page full of queries instead of a downloaded file you need to explore the settings. Normally file download is the default but for some reason it is not on your server. Explore the other settings if you want to. Be aware that PHP servers have limits on the time a page can take to load (to prevent crashes). If you have a very big database then PHPMyAdmin may time out and not export everything. Look at the last line of the file to see if it looks like the end of your tables. This will normally only happen with large databases and nothing you have done so far comes close. You can extend the times and limits in php.ini if you have access to that file. Once the file has been saved you can use the Import tab to do the opposite and import the tables and data to another database. You would just browse to the file and accept the default settings by pressing Go but don't yet because you already have that database. The table should now be (back) in your database.